In the last five years, Ford has cut the amount of landfill waste it produces while manufacturing its vehicles by some 44 percent, keeping approximately 100 million pounds of trash from reaching the world’s landfills. But that doesn’t mean the company is about to rest on its (very green) laurels; instead, Ford has now committed itself to lowering landfill waste by another 10 percent per vehicle by the end of 2013—at which point, the automaker would be creating an average of just 20 lbs. 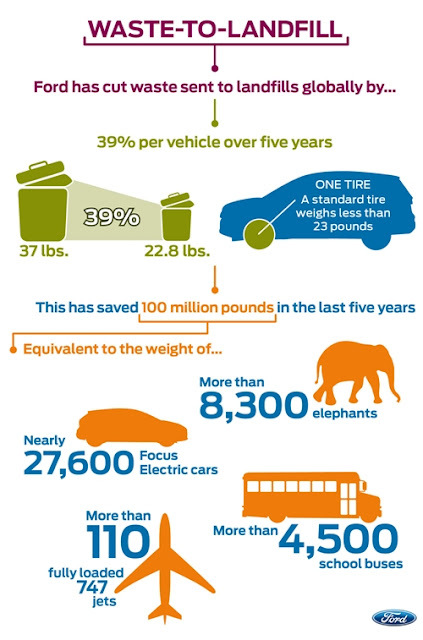 of waste materials per vehicle. And impressively, the Blue Oval has been doing an even better job at reducing its impact on the environment here in the U.S., where the company has reduced its manufacturing landfill waste by 49 percent in the 2007-2011 period. That’s thanks to the efforts of Ford facilities like its plant in Flat Rock, Mich., where the Ford Mustang is built. Using a new finishing process, waste paint solids are being recaptured and recycled into energy that helps keep the line running. The Wolverine State hosts Ford’s Milford Proving Ground as well, where a solar-powered trash compactor also is helping transform waste into energy—not landfill deposits. Combined with previous recycling programs at the Proving Ground, the facility now sends exactly zero waste to landfills. And similar efforts are ongoing throughout the country. “Reducing waste to landfills is one of our top environmental priorities and we continue to challenge our teams to identify and implement innovative solutions,” said Andy Hobbs, director of Ford’s Environmental Quality Office. At Brighton Ford we strive to continue these efforts to be more ‘green’ and reduce our waste as well. If you have any questions about Ford’s waste reduction efforts please feel free to Contact Us, we would be happy to answer.